On October 26, 2017 at 11:30 (subject to change) I’ll give my first talk at a conference. While I loved my Macintosh Classic when I was a kid, I really started IT with FreeBSD. I loved how simple and elegant this OS was. I’m not saying it wasn’t complex and difficult to use, but the software engineers behind seemed to like simple things (as in good design). When I heard that Apple used BSD as its underlying kernel, I quickly jumped and bought a white iBook. And that was love at first use. I missed the open source part, but how happy was I to have a computer which could do a lot out of the box. And I never looked back. My first job was at Apple, as an AppleCare agent. I quickly moved to Tier 2, then became a Software Test Engineer thanks to Benoit Roche. But that was just before the release of the iPhone, where all the resources were dedicated to it, and i wasn’t in the loop. I got QuickTime for Windows. Adding the fact that this was in Ireland and my girlfriend was living in Paris, i quickly resigned and came back to Paris. Well... enough digression. Long story short, I became a MacAdmin. And implemented Jamf Pro in 2011. I instantly loved this product, thanks to the Jumpstart. I love that it was made by and for MacAdmins. The community is positive and helpful, something quite rare in IT administration. Six years later, I will be on stage to talk about its Open Source ecosystem. 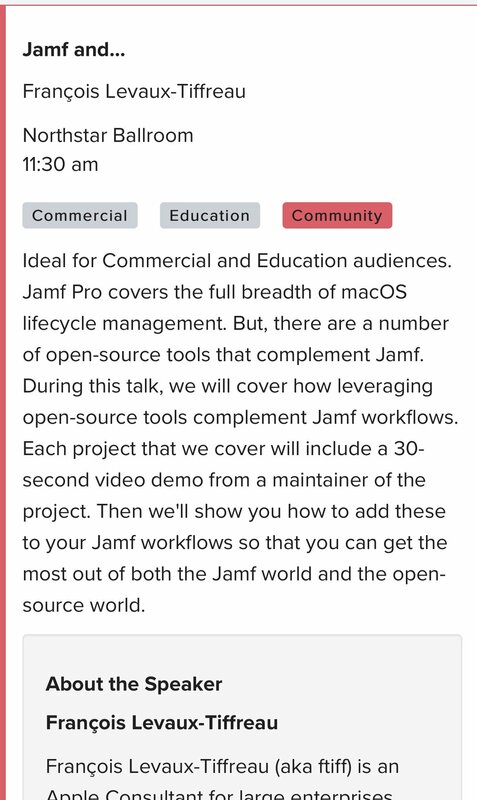 My goal is to invite MacAdmins to use open source projects with Jamf Pro, and get them to contribute back to the community. I was a consumer for ten years, until I started to release some scripts and tools. Releasing a new version of pmbuko’s KerbMinder was a major milestone for me. At that time, few people knew about Enterprise Connect, and NoMAD didn’t exist. Perhaps I helped spark the « you don’t need to bind your Mac computers anymore » by adding a login dialog box to KerbMinder. Joel and Rick did such a good job we soon decided to stop development of KerbMinder and ADPassMon. Then I started SplashBuddy. I focused on the things I love most: good design, open source and community. Today, many people use it. I don’t have the exact figures, but I know it’s used in many environments worldwide. The feedback has been overwhelmingly positive. If you have an Open Source software you're using with Jamf and would like to showcase, please give me a shout on Twitter (@ftiff) or Slack.